Mann, That’s A Shame… | Why Mr. Pink? The Last Of The Mohicans is a strange beast. Part fairytale, part frontier actioner, part romance, part period drama – and as a result – wholly messy. Perhaps director Michael Mann is juggling too many balls to successfully get across what he wishes to say. The film sees Hawkeye (Daniel Day-Lewis) and his adoptive Mohican family unwittingly become the escorts to two Scottish Colonel’s daughters (one of them being Madeleine Stowe’s Cora) and their protective officers as they search for Fort William Henry in the middle of the 18th century French and Indian War. On their way, pursued by a bloodthirsty Huron warrior Magua (Wes Studi) on a personal vendetta against the Scottish Colonel, they encounter love, tragedy and violent battles. From the outset it is clear to see the affection Mann has for the original 1936 movie version. One of his earliest filmic memories is seeing Randolph Scott in the role Daniel Day-Lewis takes up in his version. Mann waltzes through his gorgeous locations with a confident fizz; dropping to slow motion occasionally in an attempt to make the audience fall in love with them too. The problem is, they already look stunning thanks to Dante Spinotti’s wonderfully lush photography, so Mann’s gratutious leering acts only as distracting. Back to the juggling balls. 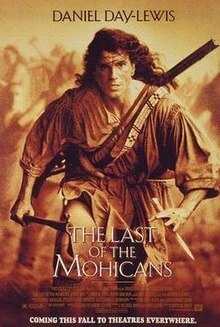 Had Mann concentrated on the plight of the dying-out Mohican tribe and the conflict between them and the Huron, with the greater war and love stories as secondary story-lines, The Last Of The Mohicans could have been the stirring epic it deserved to be. Unfortunately, Mann smacks the (highly unlikely) love story between Hawkeye and Cora centre stage, which softens the impact of the interesting side-plots. Don’t get me wrong, Day-Lewis is quite marvellous in the role; bringing as much nuance and charm to Hawkeye as he possibly can out of a fairly drippy screenplay. Madeleine Stowe on the other hand, through no fault of her own, is left with nothing to work with but a cardboard cut-out of a character. The real treasure is Wes Studi as Magua. He is vengeful, unrelenting and merciless; a real nightmare. Perhaps a little unbelievable, but nonetheless, he injects the film with some genuine threat and menace. The film’s beautiful, epic, aching score by Randy Edelman and Trevor Jones is another plus-point. Drifting from searing orchestrals to pan-pipes at the drop of a hat and he provides both a genuine sense of time and place, and a thumpingly good Hollywood accompaniment. The film does have one stand-out set-piece. After the English have surrendered Fort William Henry, the Huron lay seige on their retreating army. Mann stays out of the way of the action for most of the scene, allowing the camera to nestle at a comfortable long to mid range in order to encapsulate the dreadful act of the Huron. This is a visceral glimpse of what the film could have been. Sadly, what it turns out to be after scenes of incomprehensible battles, clumsy edits, clunky dialogue and dodgy accents is, essentially, a film about Daniel Day-Lewis running through the woods with guns in his hands, sometimes shooting those guns, sometimes in slow motion. Disappointing.